Make a good (and lasting) impression with square business card printing. These high-end cards have a style all their own. 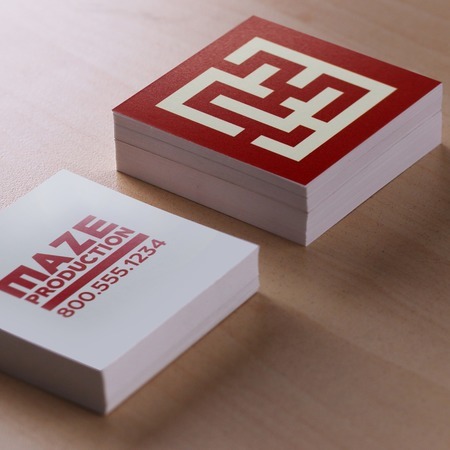 The unique square shape, lends itself to a number of business card design ideas. For instance, you can use them as a social card for extending your social network. Simply include your Facebook, Twitter and LinkedIn info in your layout. You could also design square business cards with your company information on one side and only a photograph on the other side. Square business cards are an eye-catching, yet still classic alternative to regular cards. These creative business cards lend themselves to popular minimalist design trends and have a modern look ideal for professionals who want to stand out in a subtle way. Realtors, salons, sales teams, and graphic designers alike can use square business cards to send a delightfully understated message. Jewelry business cards are a popular application of this shape, as they can easily fit in jewelry boxes of all sizes, easily going home with every purchase. Visit the UPrinting Blog to learn tips and more about the design and application of these and other die-cut business cards. Check out these articles to inspire your own design.